Sound the klaxons! 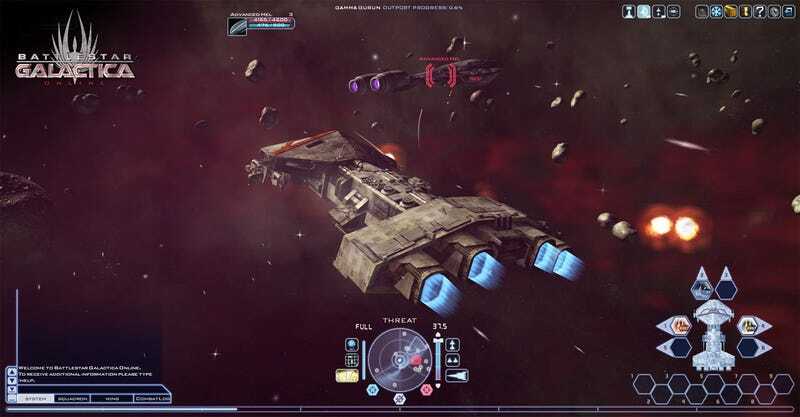 Battlestar Galactica Online has just warped out of closed beta and into open beta, allowing players all over the world to dive head-first into free-to-play, browser-based battles set in the universe of the hit Syfy television show. Players looking to join the conflict between the humans and the Cylons need only register at the game's official website and hit the play button. Within minutes they'll be plunged into the depths of outer space, piloting a fighter vessel and shooting down sensor arrays like a pro. At least that's what happened when I started up a character on the Cylon side. Figured I'd cast my lot with the winning team right off the bat. Silly meatbags. So far it plays like one would imagine a free-to-play, browser-based MMO would play. It's relatively attractive and handles itself well, though flight stick support would be appreciated. Hiot up the link below to check it out for yourself.